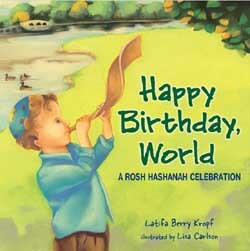 Happy Birthday World: A Rosh Hashanah Celebration by Latifa Berry Kropf, illustrated by Lisa Carlson. Celebrate Rosh Hashanah with your children over a good Jewish book. Here is a fun and meaningful way to start the Jewish New Year. One night in September, after your children put on their pajamas, set aside their regular bedtime books and guide them through a wonderful journey, a Jewish journey to their roots. “Close your eyes and imagine that you are flying over earth, witnessing the birthday “ the first Rosh Hashanah. “Look at the unspoiled, white sand beaches; the tall mountains, covered in green, healthy forests; the miles of savannah with animals running wild; the beautiful sky that turns from white to shades of red, orange, blue and purple. “Listen to the birds announce the first sunrise; the waterfall fill the river with crystal clear water; the ocean stretch toward the sky and crash down in a wave. “Listen to what we don't hear. We hear no sirens, no yelling, no war. “This was the world that we were given on the first Rosh Hashanah." Then, stop talking and listen. Listen to their reactions: let them share their thoughts and ask questions. Reflect what you hear and probe them to go further and deeper, according to your child’s age. Share a bit about your views, but mostly prompt them to explore. Think of it as an anthropology study – your own. When you do not know an answer, promise to look it up. Take these conversations seriously. You are helping to set the foundation for your child’s character and identity. Your child's heritage is a major part of his identity. Yes, this heritage is largely a reflection of your personal religious and secular beliefs, culture and traditions but it also includes those of your ancestors. You may embrace your heritage or you may have taken your own path and know little of your ancestors’ traditions and beliefs, but all children crave to know more about their inherited past. They instinctively know that getting these roots will give them strength. Imagine a tree – it may sway in a storm, some of the branches or leaves may be lost, but the roots give the strength to survive the winds. As my children were growing up, bedtime was a special time when some of our most important discussions occured. I am sure that part of it was an ingenious attempt to delay sleep, but I believe that comfort and closeness set the stage for relaxed, good conversation. Books and stories were the perfect conversation starters. If your child liked the quick imagery activity that I created, why not create your own or read a book to them on another night in September? There are many children's books that share the practices and beliefs behind Rosh Hashanah and other Jewish holidays, history, culture, and traditions. A new free opportunity exists to keep these bedtime heritage conversations going all year long. The Harold Grinspoon Foundation has launched the “PJ Library” program in Philadelphia (no relation to the PJ Voice). Each participating family will receive a monthly mailing of a Jewish children’s book, CD, or the occasional parenting resource. The program is available free for the first year to children up to age five and a half living in the Greater Philadelphia area. Families will have the opportunity to re-enroll their children with an optional charge of only eighteen dollars. This will help offset costs so others in the community can receive PJ Library books. The PJ Library is the brainchild of philanthropist Harold Grinspoon, who found his inspiration in country singer Dolly Parton. "About five years ago I brought Dolly's Imagination Library - which distributes books to inner-city children - to Western Massachusetts," Grinspoon explained. "Then it occurred to me -- this is the ideal project to adapt to the Jewish community. We need to get Yiddishkeit into into the homes of unengaged Jewish families in a positive way. 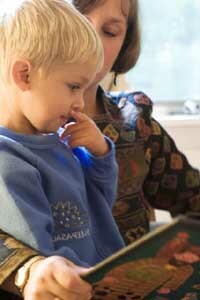 Grinspoon knew that reading stories and listening to music are among the most powerful childhood learning experiences. Parents and children have warm memories of that special time right before bed where snuggled together, they end the day with a book. In Winter 2005, he decided to turn these special moments into "Jewish moments". He named the library "PJ" -- short for "pajamas" -- with the notion that books and music add to the magic of bedtime. Thanks to the generosity of the Harold Grinspoon Foundation, the Allen A Stein Family Foundation, CMS Companies, The Jewish Federation of Greater Philadelphia, Auerbach Family Foundation and other private funders, the program is free to 2500 children. Enrollees will be accepted on a first come, first serve basis. Additional applicants will be placed on a waiting list as they secure additional funding to bring this wonderful program to all children in our community. Friends and family members who live in the Greater Philadelphia area may sponsor a child from out of town for sixty dollars per child per year. This new program has an added benefit for many of us who may not be as familiar as we would like with Jewish beliefs, culture and traditions. By reading the books to our children, we’ll learn, too! You may sign up online for the program. For more information about The PJ Library nationwide, please contact National Director Marcie Greenfield Simons, at The Harold Grinspoon Foundation headquarters, phone (413) 439-1981, email: Marcie@Hgf.org.